Bottle Cap Bike – headed home back through Dublin. 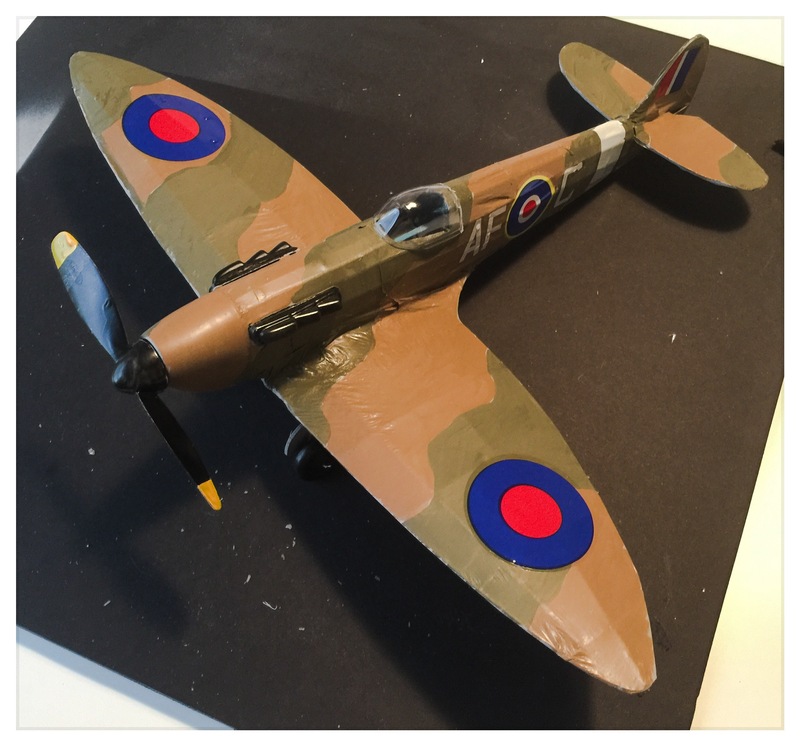 Aces High – the little fighter is complete. 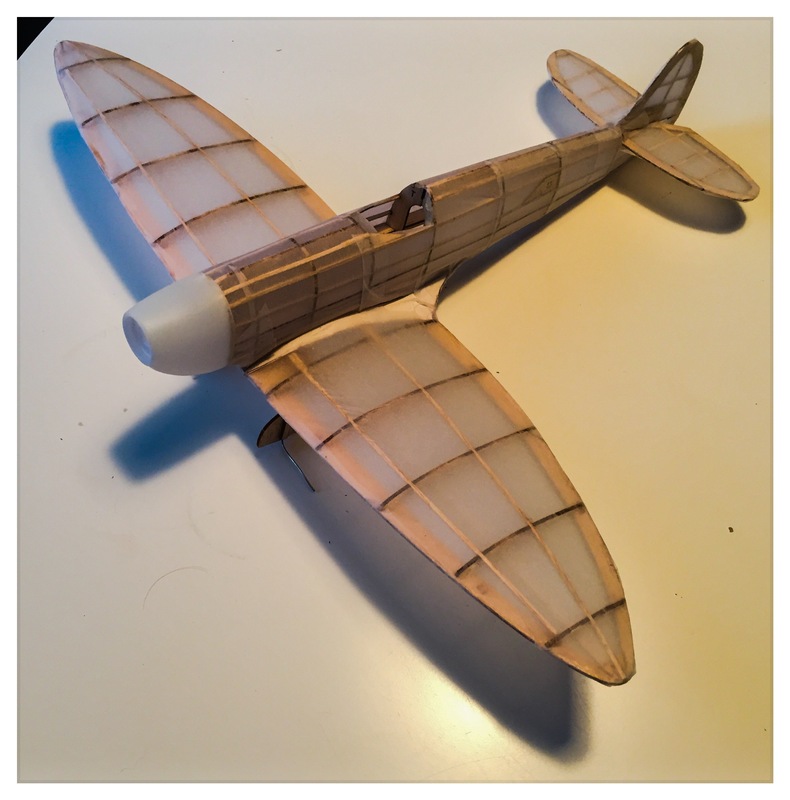 Though I rushed and mucked up the tissue a bit, it is presentable and probably decent enough to wind up and fly. A Skin Game – delicate less than paper thin tissue sheets glued over the spars, ribs and stringers; then a spray down with water and the covering becomes drum tight. Need to find a cellulose dope alternative to give the paper added strength. 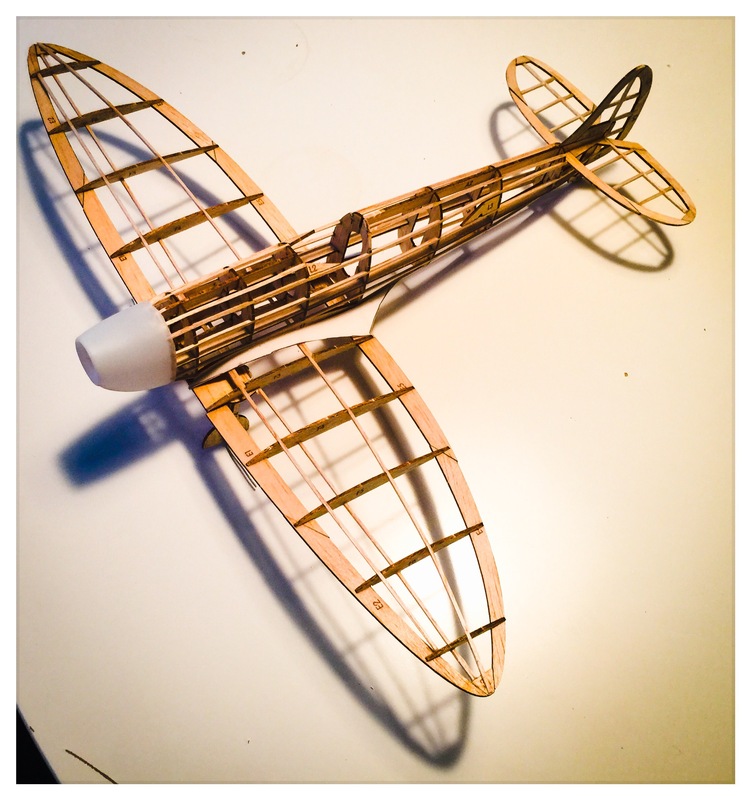 Supermarine – the balsa Spitfire is taking great shape. Indeed the classic elliptical wing designed by Canadian aerodynamicist Beverley Shenstone is obvious. RJ Mitchell’s overall layout is pure in form and elegant in execution. Tissue paper covering next! Please don’t make me angry; you won’t like me when I’m angry. 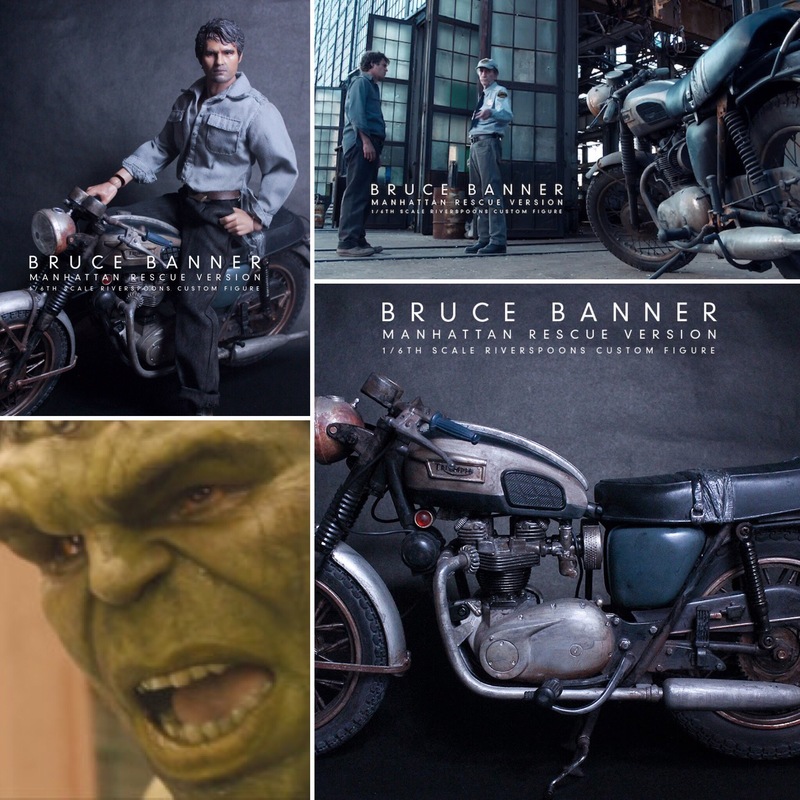 The latest iteration of the green behemoth via The Avengers movie sees the diminutive physicist Dr Bruce Banner being played by as bespectacled Mark Ruffalo. His mode of transport? A dusty patina’d Triumph looking like it’s seen plenty of lonely miles. 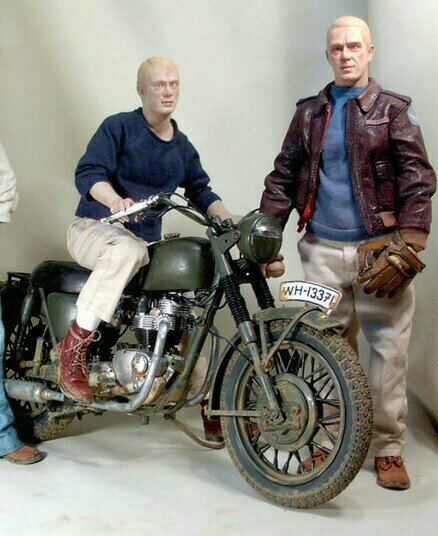 This model kit at sixth scale certainly lost is the part for any comic book fan. 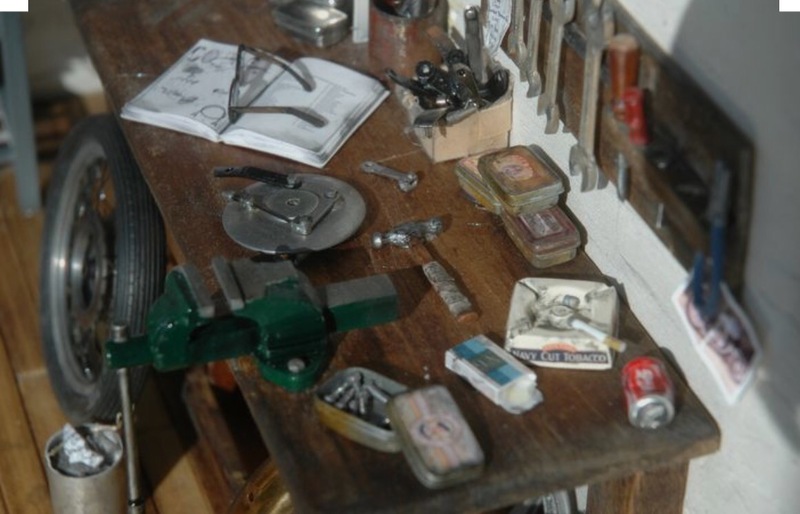 Oil Thumbed Haynes manual, packet of Players No6 fags, and a well used pein hammer. 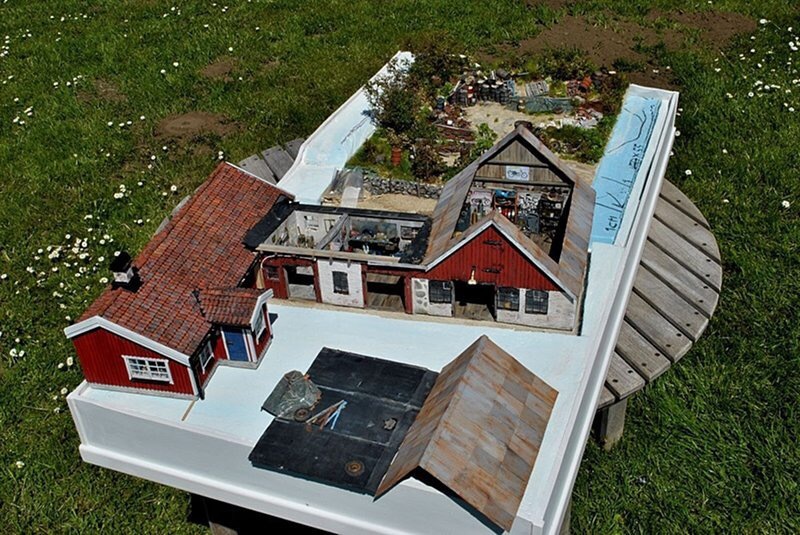 Yes, it’s another scratchbuilt diorama fabricated from base plastic and wire. Scaled reality. 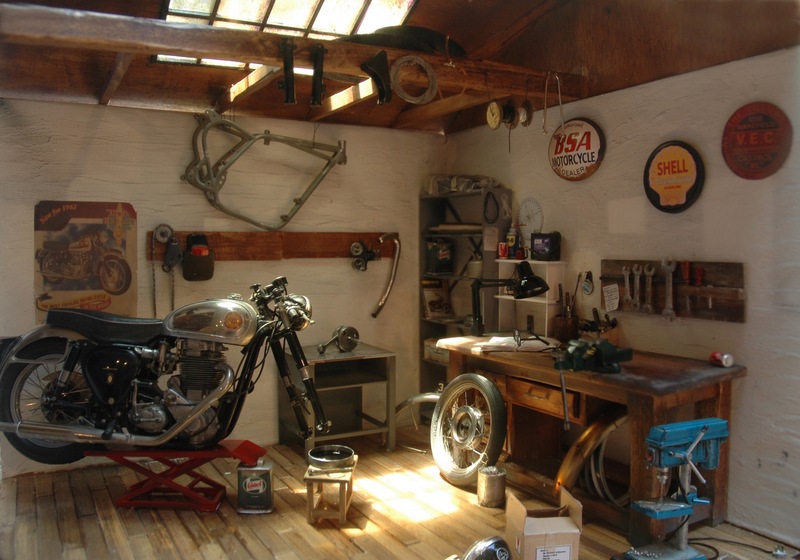 Based around the sublime BSA Goldstar it’s a watchmakers motorcycle restoration. Love the daylight beaming in from a roof light. 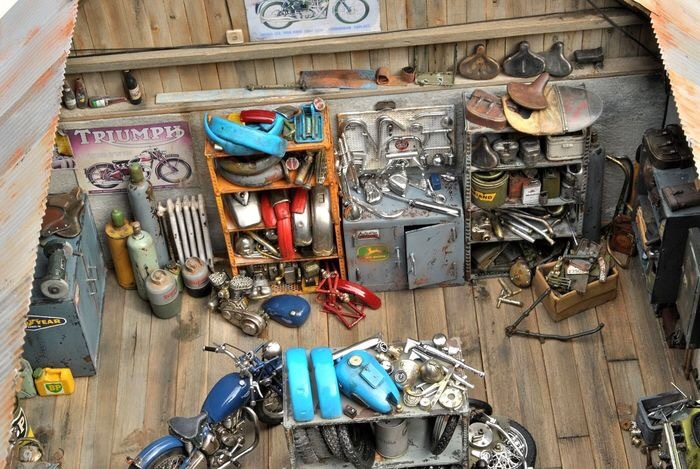 There is even a junkyard out back… Pinup gal on the wall… It keeps going! 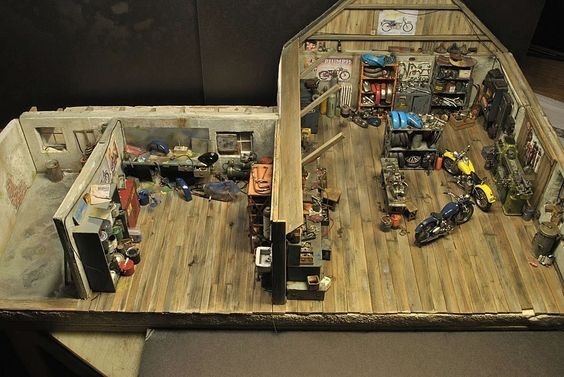 Amazing Intricacy – a well used motorcycle workshop in miniature. 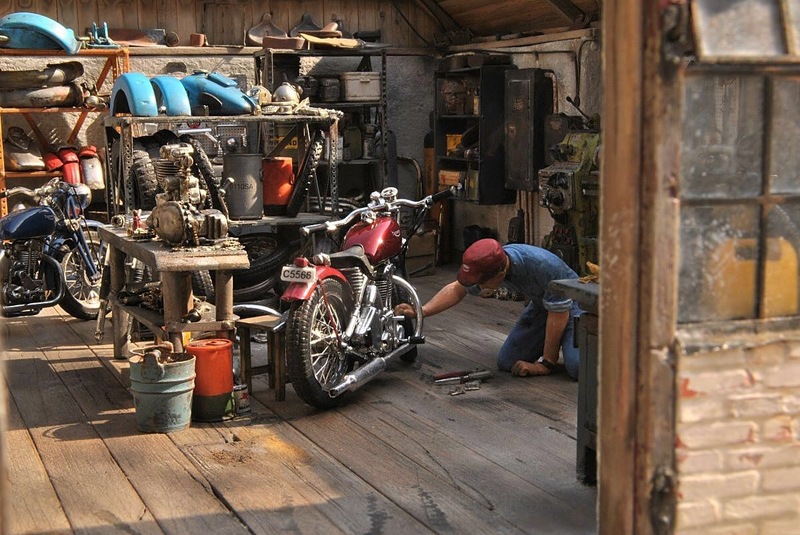 As well as moto’s being worked on there are shelves of parts, walls of tools, machinery, posters and a cursing mechanic. 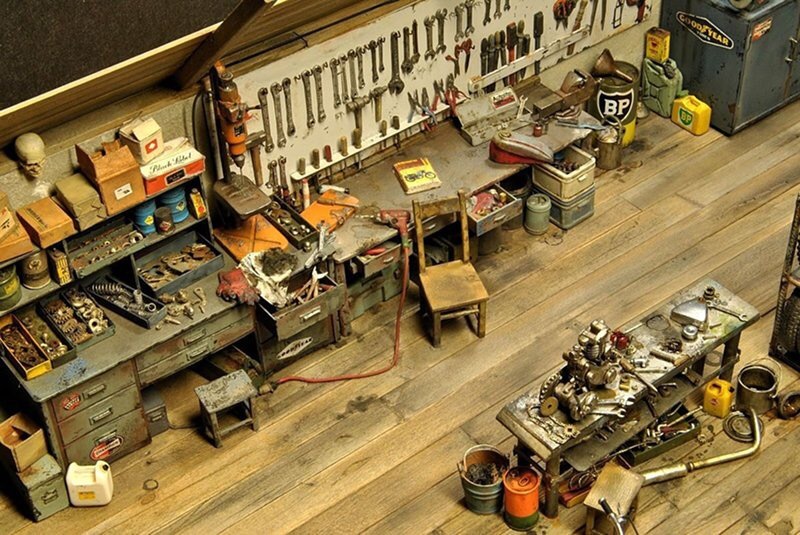 So much detail to explore, you can smell the oily workings or metallic contrivances. Even a corrugated roofing. 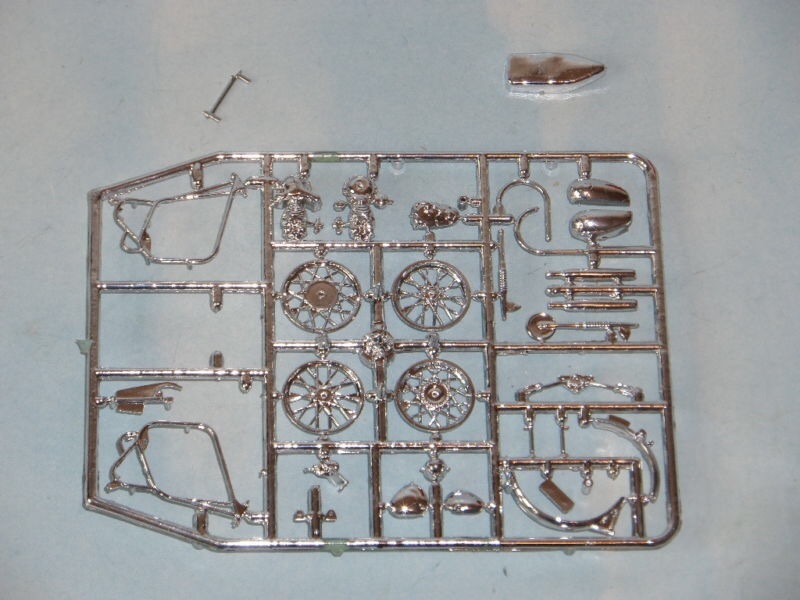 I bet the Whitworth set is articulated too! 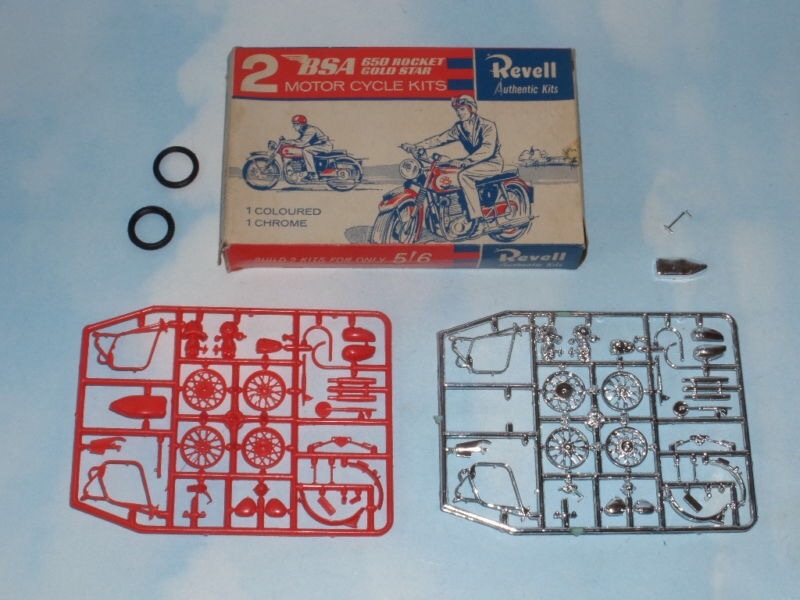 A neat looking plastic model kit: which includes two bikes. One in red, the other chrome. 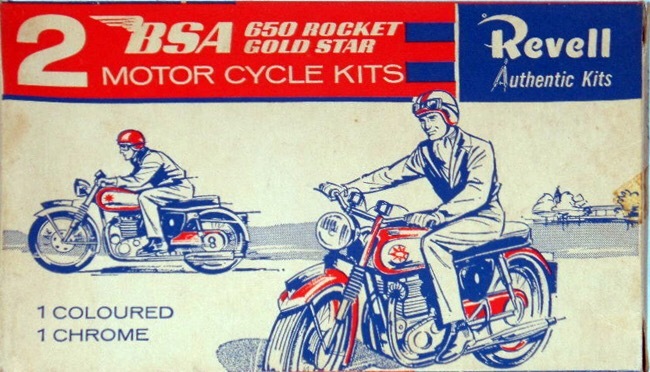 These are the superlative early sixties Rocket Gold Star from BSA. 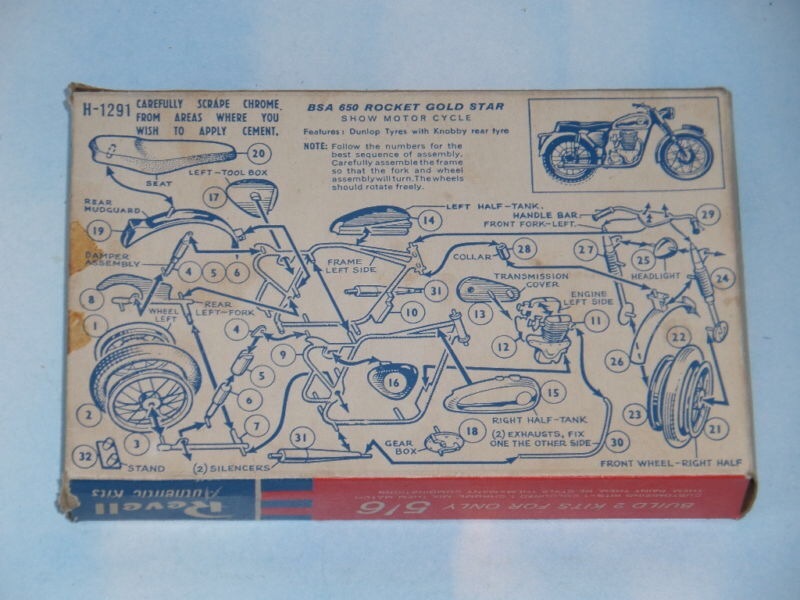 Box back assembly instructions are fairly basic and no decals. 5’6d from your local hobbyist shop. 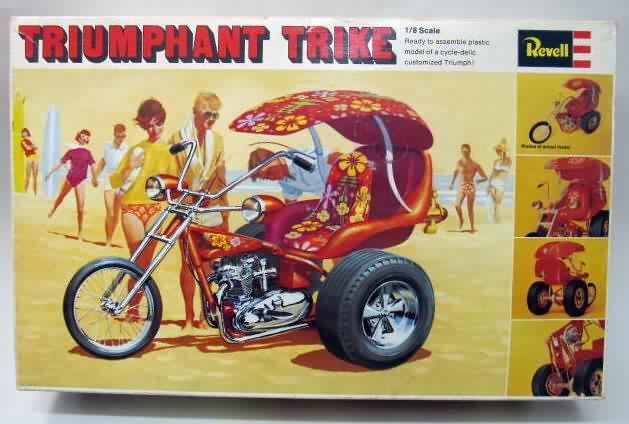 Sixties Fab Fun: The Kandy Kolored Tangerine Flake Streamline Baby Trike. 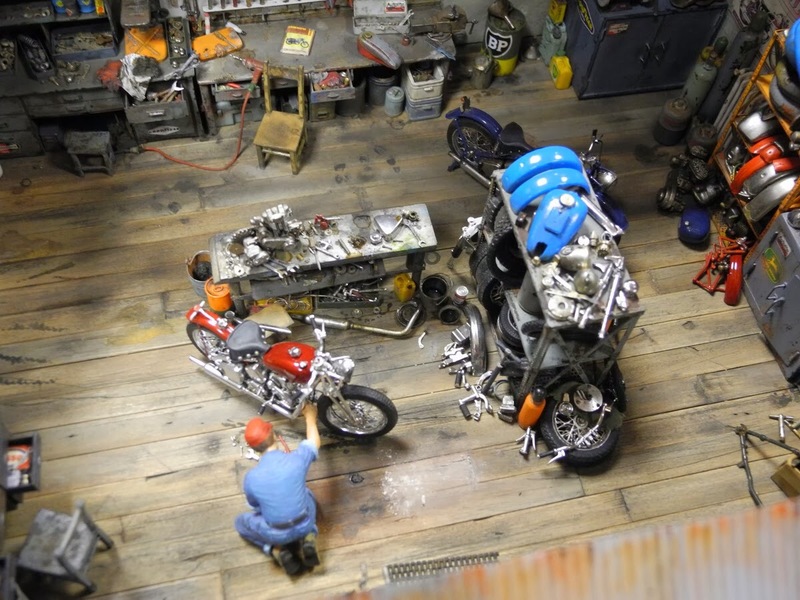 Rebellious model kit for aspiring custom bike builders. An honorable mention to author Tom Wolfe and his new journalism writing style which evoked a vivid reality in a world of hallucinations. The annual celebration of those departed when candy skulls and marigold adorn the gravesites of family and friends. 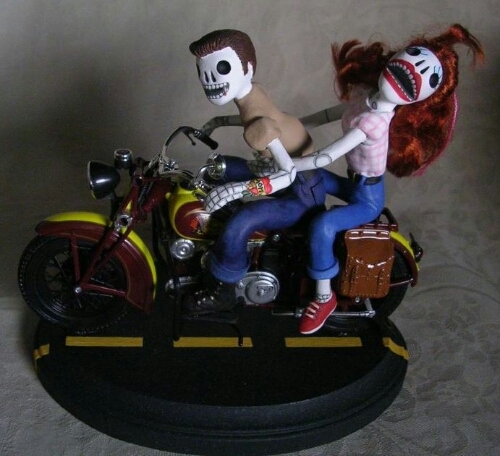 Calacas, or skeletal, figurines denote the life of the passed living. 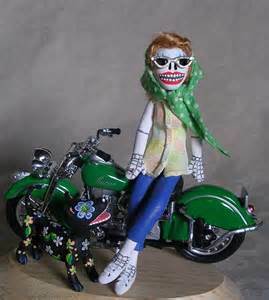 Though a Mexican tradition it roots stem from precolonialism Aztec culture.